Streams and rivers play a critical role in the hydrologic cycle that is essential for all life on Earth. A diversity of biological species, from unicellular organisms to vertebrates, depend on flowing-water systems for their habitat and food resources. Like all natural ecosystems , streams and rivers are subject to change through time. Over a geologic timescale, major changes can occur. Over smaller timescales, such as the human lifespan, changes are usually so gradual that they are nearly undetectable. However, in some cases, the process is greatly accelerated by disturbances that are related to human activities, either directly or indirectly. These accelerated changes may stress the system and lead to substantial changes in the biological community. One of the most common human-induced changes in a flowing-water system is long-term or permanent change in the volume of water flowing through the river or stream channel. Long-term variability in streamflow is distinguished from natural short-term variability typically associated with seasonal weather variations. Long-term records of streamflow data have been collected at thousands of sites throughout the United States by the U.S. Geological Survey. Two examples of these records are shown in the figure on page 134. The trendline on the top graph shows a gradual but substantial decrease in mean (average) daily streamflow in the East Branch of the Delaware River (New York). 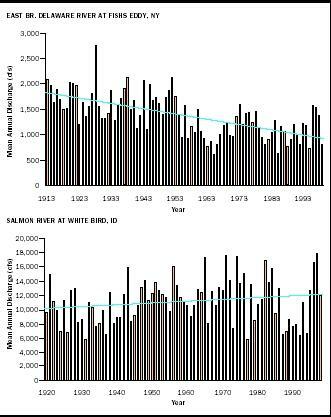 The bottom graph shows a gradual increase in streamflow in the Salmon River (Idaho). Short-term (annual) fluctuations of great magnitude are superimposed on these long-term trends. Year-to-year fluctuations over a broad range are common to nearly all flowing-water systems, but they do not correspond to permanent changes in the normal flow. Hence, a true picture of long-term trend cannot be attained by examination of only a few years of data. The longer the period of perspective for assessing how the system is changing, the more accurate is the assessment. Short-Term Fluctuations: Causes and Benefits. Floods and droughts are disruptive to inhabitants of the stream system (whether animals, plants, or humans), but they are integral events within the stream's hydrologic and ecological cycles. Their frequency and intensities are critical factors that control the biological community structure and the transport of substances downstream. The Apalachicola River and bottomland hardwood wetland in northern Florida, like many other large river systems in the southeastern United States, is a notable example of a system whose character is highly dependent on short-term flow variations and periodic flooding. Heavy rains in the upstream watersheds can increase streamflow by a factor of 10 or more in early spring. This produces an annual cycle of inundation that is critical to the distribution of bottomland hardwood tree species and other biota in the expansive floodplain. The year-to-year variation in annual mean streamflows is evident from the bars in these two graphs. Only when several decades of data are examined will trends become apparent. The East Branch Delaware River shows a trend of decreasing streamflow (blue line, top), whereas the Salmon River shows an increasing trend (blue line, bottom). Discharge is plotted in cubic feet per second. sometimes devastating (such as the Mississippi River flood of 1993). However, if the system returns to near-average flows within a relatively short time, it will not necessarily be subject to long-term ecological effects. A long-term or permanent change, on the other hand, produces a continual trend—either downward or upward—in the mean annual flow of the river or stream, as shown previously in the figure. The permanent change in water flow will likely result in permanent changes in habitat and environmental conditions for the plants and animals that occupy the river, its drainage area, and the downstream ecosystem. The above discussion has focused on temporal variability of flow—changes with time in any given river or stream. Another kind of variability is spatial—differences by location in the river or stream at any given point in time. The conventional concept of streamflow is that it gains volume in a downstream direction. According to this concept, a stream's headwaters begin as a trickle high in the watershed, where the drainage area is small. As the stream progresses downslope, its drainage area becomes larger; hence, more water is delivered to the stream via precipitation, runoff, and groundwater inflow. This increase continues in a downstream direction as more runoff enters the channel; eventually, maximum discharge is reached where the stream exits the watershed (i.e., its outflow). Hence, for a typical stream not regulated by dams nor heavily used for water withdrawals, the expected spatial variability is an increasing gradient of flow in a downstream direction. Some river systems, however, deviate substantially from this expectation. Occasionally, deviation is due to natural characteristics of the system, such as loss to groundwater in the lower reaches of the channel. More often, however, the causes of the water losses downstream are water withdrawals or flow controls associated with human management of the system. Probably the most well-known case in the United States of river flow depletion due to water withdrawals is the Colorado River. * Fed by snowmelt from the vast slopes of the Rocky Mountains, the Colorado River is one of the country's major surface-water flow systems. Despite this ample water source and the great size of the river, its location in the arid Southwest makes it particularly vulnerable to flow depletion. Through much of the river's southwestward course from the headwaters in the Colorado Rockies, its water is drawn away from the channel to supply the thirsty needs of agriculture and urban water supply. Total water consumption from the river below Hoover Dam in 1984 was more than 7 million acre-feet (2.3 trillion gallons), of which more than 6 million acrefeet was for human water use and about 1 million acre-feet was due to evapotranspiration . The list below summarizes water flows, in cubic feet per second, during four months of the year (2000) at several long-term stream gaging sites along the Lower Colorado River. The means (averages) were calculated from daily records of the U.S. Geological Survey. Lees Ferry is the gaging station furthest upstream in this set of eight sites; Laguna Dam is the furthest downstream. Hence, each row, when read from left to right, represents the change in streamflow in a downstream direction. As the list shows, the resulting downstream flow "profile" of the Lower Colorado River is the inverse of the typical pattern. Instead of flows increasing in a downstream direction, they are decreasing. The river flow measured below Laguna Dam (near Yuma, Arizona) should be the largest in this set of eight sites, but instead is only about 4 to 5 percent the volume measured below Hoover Dam, which is approximately 124 kilometers (200 miles) upstream of Laguna Dam. As a result of the cumulative withdrawals from the Colorado River, outflows to the Sea of Cortez in Mexico often are negligible. Combined with a high evaporation rate and very low rainfall, the low degree of river input into the sea has led to the development of an inverse estuary in the Upper Gulf of California—its salinity decreases from the river mouth outward. Channelization or other alterations of the natural stream channel. An indirect effect of human activity that ultimately may prove to be more important than all the direct effects is global climate change. The scientific evidence is increasingly compelling that increased greenhouse gas emissions, particularly since the Industrial Revolution are linked to global warming. Many aspects of the hydrologic cycle, including streamflows, are highly sensitive to climate change. Data combined from diverse sites around the United States during the twentieth century clearly show increasing trends of precipitation, streamflows, and damages due to flooding. It seems likely that these kinds of trends will continue indefinitely in the future. SEE ALSO Colorado River Basin ; Drought Management ; Ecology, Fresh-Water ; Floodplain Management ; Estuaries ; Fish and Wildlife Issues ; Global Warming and the Hydrologic Cycle ; Instream Water Issues ; Runoff, Factors Affecting ; Stream Hydrology ; Uses of Water. Apalachicola River, Florida: A Summary of the River Quality Assessment." U.S. Geological Survey, Water-Supply Paper 2196-D (1988). Lavin, M. F., V. M. Godinez, and L. G. Alvarez. "Inverse-Estuarine Features of theUpper Gulf of California." Estuarine, Coastal and Shelf Science 47 (1998):769–795. Leitman, H. M., J. E. Sohm, and M. A. Franklin. "Wetland Hydrology and Tree Distribution of the Apalachicola River Flood Plain, Florida." U.S. Geological Survey, Water-Supply Paper 2196-A (1983). Light, H. M., M. R. Darst, and J. W. Grubbs. "Aquatic Habitats in Relation to RiverFlow in the Apalachicola River Floodplain, Florida." U.S. Geological Survey, Professional Paper 1594 (1998). National Water Assessment Group for the U.S. Global Change Research Program. "Water: The Potential Consequences of Climate Variability and Change for the Water Resources of the United States." Pacific Institute, 2000. Owen-Joyce, S. J. "Accounting System for Water Use by Vegetation in the LowerColorado River Valley." U.S. Geological Survey, Open-File Report 92-83 (1992). * See "Colorado River Basin" for a location map of the Colorado River. * See "Stream Hydrology" for an example of a hydrograph showing streamflow variations within a 1-year period.